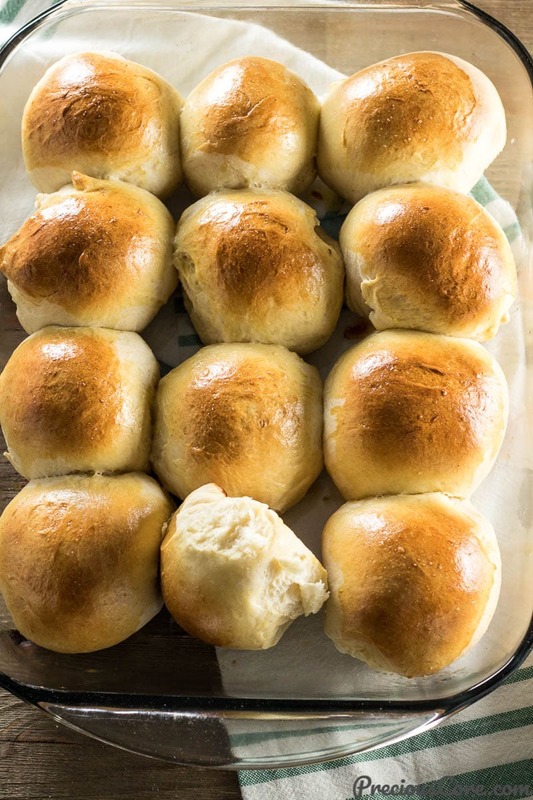 Sweet Dinner Rolls that are so fluffy, so rich and will make your kitchen smell like heaven. 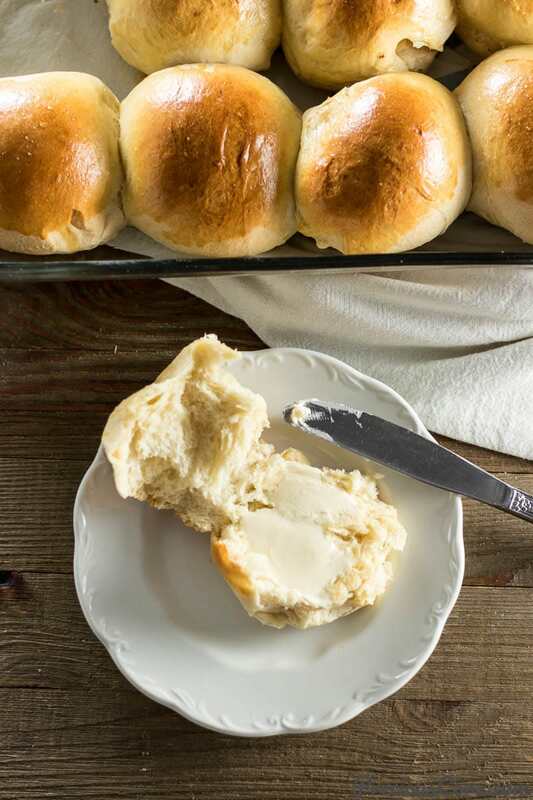 These sweet rolls are perfect for breakfast, brunch or dinner. 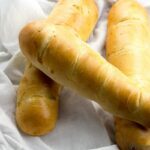 Or even use these as sandwich bread for lunch! Why not? From the time I started making homemade bread, store-bought bread has lost its appeal. When I mix my own dough, let it rise and bake, I am totally sure of what I’m getting. I can also add whatever I like to my dough. 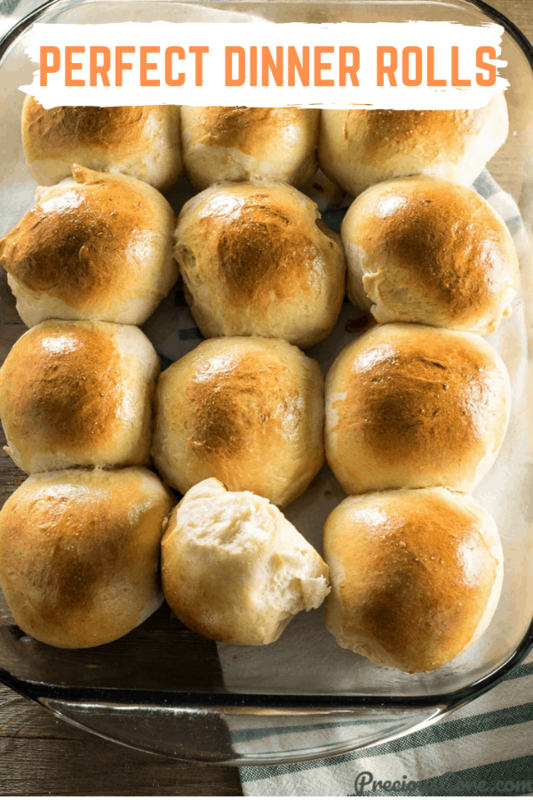 Homemade bread is exciting and these fluffy sweet dinner rolls are no exception. They are so good on their own but I love to slather on some butter so you know, I can take them to the next level! 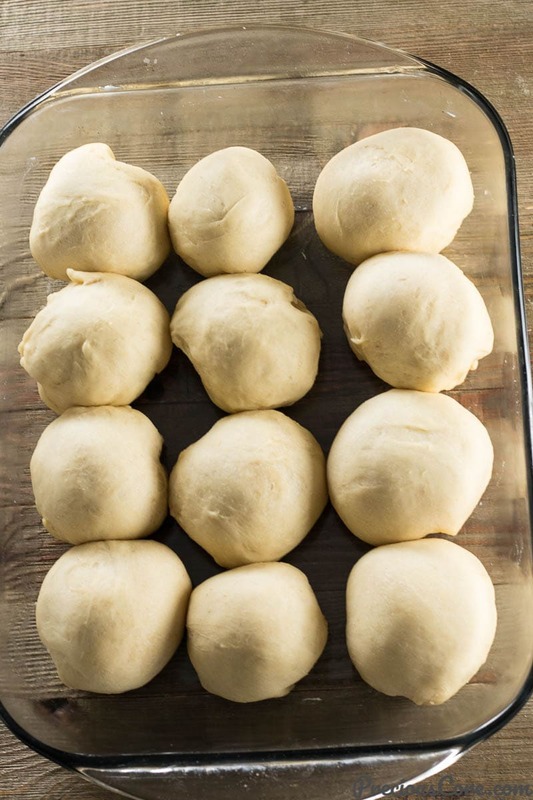 For sweet dinner rolls you need all-purpose flour, butter, milk, sugar, active dry yeast, salt and egg yolks. Use the leftover egg whites to make these yummy Coconut Macaroons. You also need 1 egg to beat and brush over the loaves AKA egg wash. That’s what makes them so shiny. 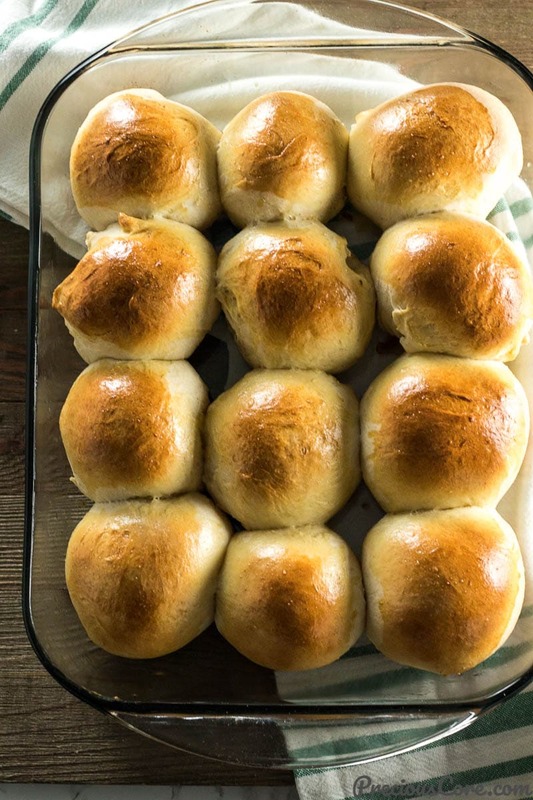 These Sweet Dinner Rolls are unbelievably easy to make. Let me put you through. 1. Make the dough. Put milk and butter together in a pot and warm on medium heat for just enough time to let the butter melt. Transfer the WARM mixture to a bowl and add the yeast. Let it sit for five minutes so the yeast can activate. Next add in the eggs, sugar, and salt and mix together properly. Then add in the flour gradually while mixing until it forms a nice stretchy dough. Note: Your dough should not be too hard. If it is too hard, your bread will be hard. A little bit of stickiness is okay but if it is too sticky, add a little flour so the dough is easier to handle. 2. Knead the dough. Sprinkle flour on a working surface and knead the dough for 3-5 minutes. 3. Keep the dough to rise. Oil a bowl and place the dough inside. Cover with a plastic wrap and let it sit in a WARM place for about one hour or until the dough has doubled in size. I normally turn on my oven for a little bit then I turn it off and place the dough inside. It works great every single time. After about an hour, the dough must have doubled in size. 4. Shape the dough. Place the dough on your working surface. Punch it in order to remove air from it. Now cut the dough into 12 equal pieces. Take each piece and form a ball and place on a greased baking tray. Repeat process with the rest of the dough. 5. Let the dough rise again. Let the rolls sit in a warm place for about 20 minutes. After that, it must have risen some more. 6. 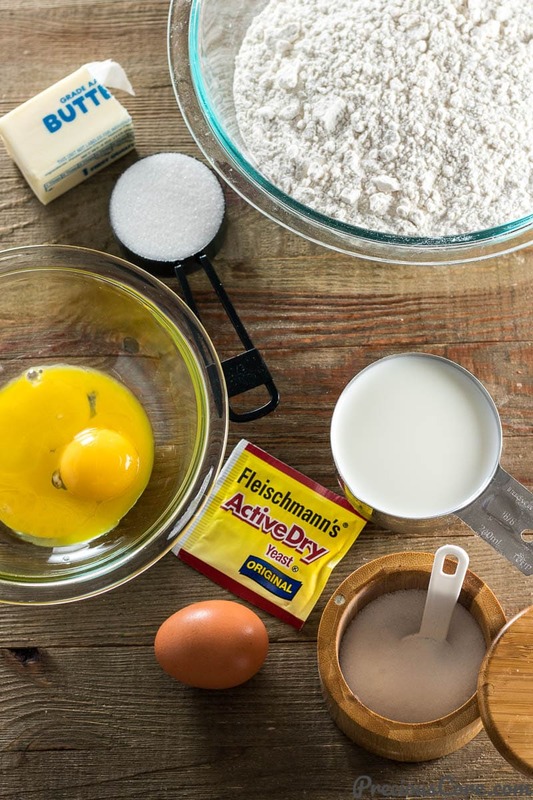 Prepare for baking. Brush the rolls with egg wash and sprinkle on some sesame seeds if using. 7. Bake. Bake in an oven at 350 Degrees Fahrenheit (180 degrees Celius) until the rolls are golden brown. Enjoy with a cuppa tea if you like. These Sweet Dinner Rolls are so fluffy and rich! Perfect for breakfast, brunch or as an accompaniment on the dinner table. Put milk and butter together in a pot and warm on medium heat for just enough time to let the butter melt. Transfer the WARM mixture to a large bowl and add the yeast. Let it sit for five minutes so the yeast can activate. Next add in the eggs, sugar, and salt and mix together properly. Then add in the flour gradually while mixing until it forms a nice stretchy dough. Note: Your dough should not be too hard. If it is too hard, your bread will be hard. On the other hand, if your dough is too sticky add just enough flour so it can come together without sticking so much. A little bit of stickiness is okay. Now sprinkle flour over your working surface and knead your dough on your working surface. I love this part! 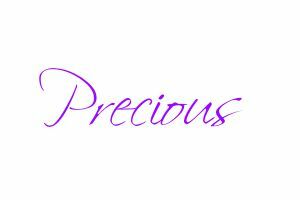 Play with it for a few minutes if you like. Oil a bowl and place the dough inside. 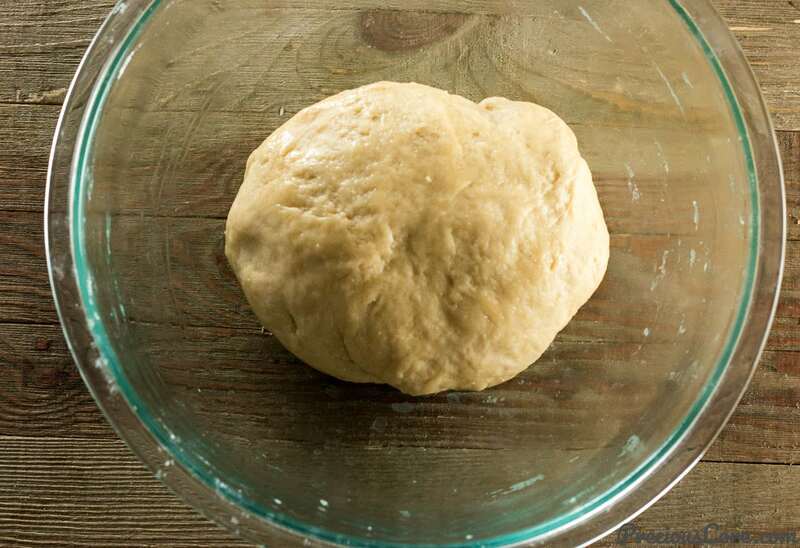 Cover with a plastic wrap and let it sit in a WARM place for about one hour or until the dough has doubled in size. I normally turn on my oven for a little bit then I turn it off and place the dough inside. It works great every single time. After about an hour, the dough must have doubled in size. 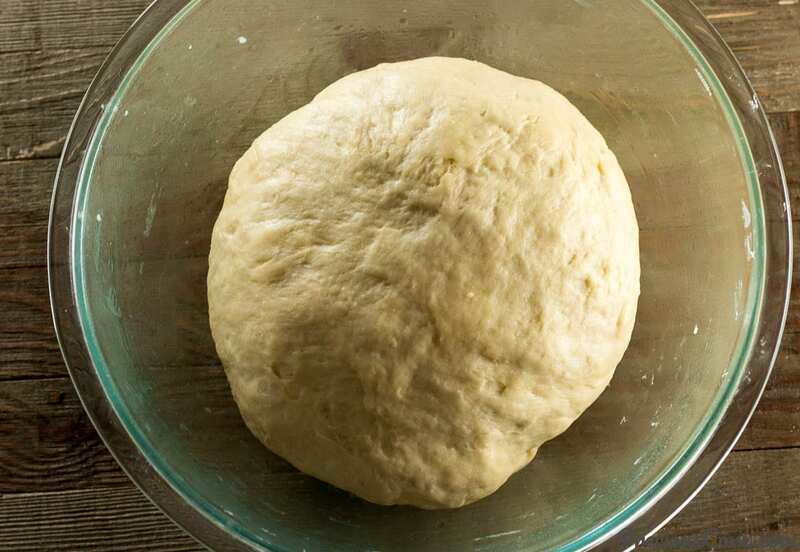 Place the dough on your working surface. Punch it in order to remove air from it. Now cut the dough into 12 equal pieces. Rub a 9 by 13 inch baking pan with butter. 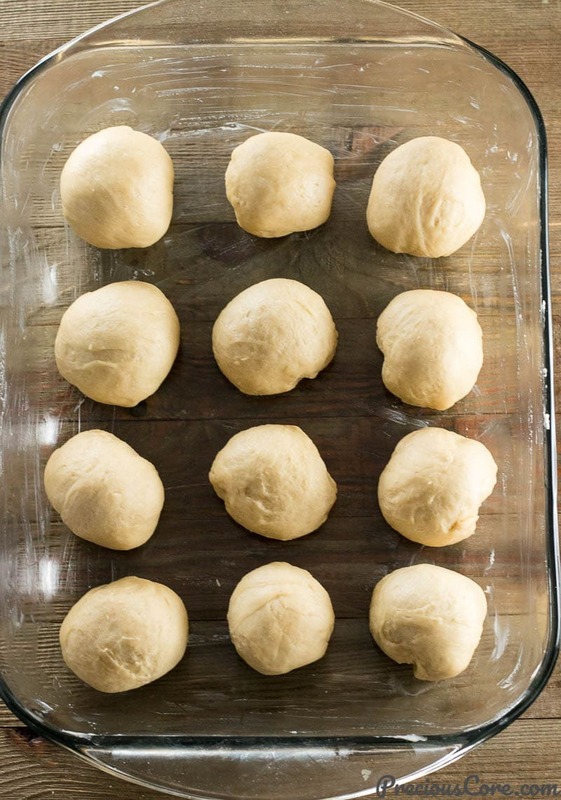 Take each piece and form a ball - pull the dough so the top is smooth and tuck the dough under. That way the top is smooth and the under is rough. Place the balls on the greased baking pan. Repeat process with the rest of the dough making sure to allow about an inch of space between each dough. Brush with egg wash. Beat the egg then gently brush over the rolls. Sprinkle on some sesame seeds if using. 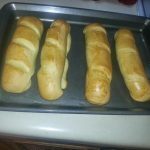 Bake for about 20 minutes or until the rolls are golden brown. 1. 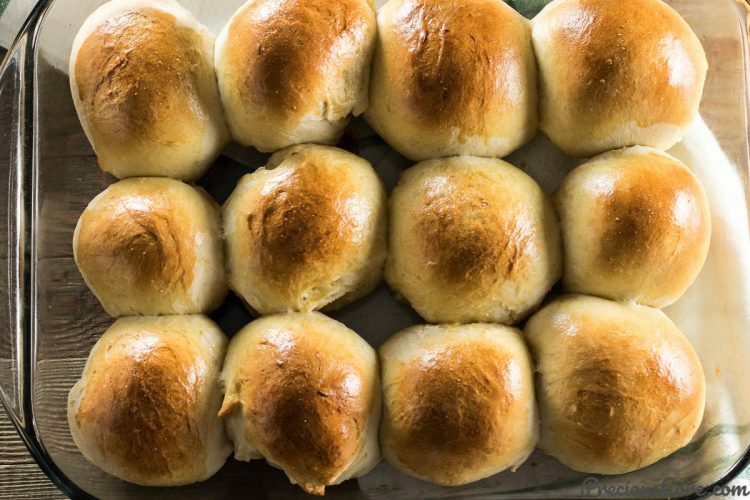 For the second rise, allow the rolls to rise until they touch each other. This is essential so the rolls are extra fluffy. It takes about 20 minutes to 1 hour to get a good rise. 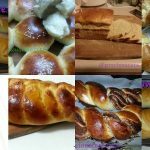 The rolls will rise quickly or slowly depending on the temperature of where you place them. 2. 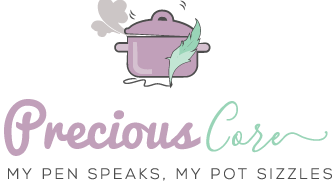 Use the leftover egg whites from this recipe to make Coconut Macaroons. Yum! Recipe adapted from Laura Vitale's Dinner Rolls. 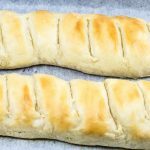 This recipe was first published on March 12, 2016. I have updated the recipe with new photos and more tips. Lol you can still be good by eating in moderation. You can half the recipe or follow the full recipe and keep the rest in an airtight bag. They are gooooood for breakfast. Happy baking! 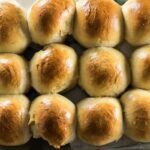 These rolls are to die for!! Thanks Precious for an easy recipe to follow with amazing results 😘. My hubby loves it, the kids too, with no leftovers. I have made this 2 times now, after the first time I understood why you suggested 3.5 – 4 cups flour after my dough was slightly tough. The rolls came out great nonetheless with no leftovers, but realized that I needed to adjust the amount of flour. The 2nd time, I used 4 cups, but used 1.5 cups milk and 0.5 cups warm water and it great. I really wish I could share the pics. Thank you so much for blessing us! Awww you’re so welcome! And thanks for your kind words!